A winter like pattern is setting up for the end of the week with a mainly southeasterly flow. A series of week systems will drift southeast along the jet stream throughout the next 3-10 days. 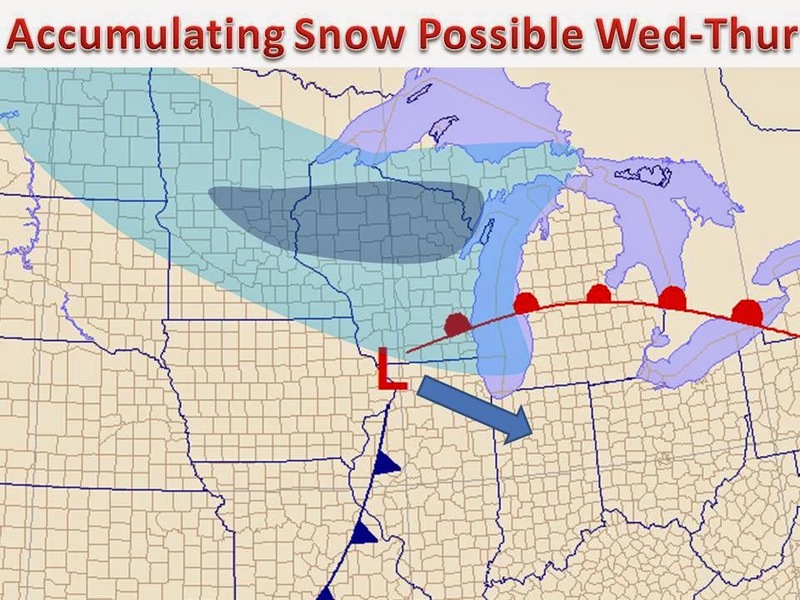 A strong shortwave will push through the Midwest Wednesday night into Thursday and produce precipitation. Current model guidance suggests that the best location for accumulating snow will set up over Northern Wisconsin, with light accumulations stretching west into North Dakota. Reality: We are entering the first week of November, and the thermal structure of such a system has to be just right. Several models are showing 1-4" of snow, but the exact location, timing, and intensity will play major roles in who, if anyone, sees the white stuff by Thursday. Either way, on the back side of the clipper system, winds will shift to a more northerly direction. Cold air will be ushered in yet again for the end of the week, with even colder air than the past several days. This pattern is similar to the one forecasted in the Midwest Weather Winter Forecast. Below is the 850mb temperatures with wind vectors super imposed, notice the flow from Canada all the way south to the Gulf Coast.